Meanwhile, Saladin's scouts see your remote outpost and decides that he shall conquer your outpost before you have time to build it into a formidable castle. Using your few remaining resources, you setup a small watchtower and garrison it with some of your best troops. At the same time, you recruit help from the people who wander the desert. 1. Don't make crossbows - you cannot sell them and you cannot make crossbowmen. 2. Defend the outpost next to the keep with your life; if it is destroyed, then good luck amassing a military. 3. The invasions occur quickly, so you will probably be unable to fully enclose your keep, but that shouldn't be a problem. 4. Spend the little stone you have wisely. 5. Locate the Watchtower as quickly as you can; it's underfire from the start! 7. I did playtest, it was a bit too easy for me, so I added another, large invasion and other stuff; I have not playtest the changes, but it hould be more than playable still. 8. 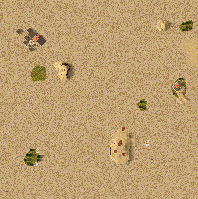 As stated above, this is NOT a skirmish map, it is a Crusader Extreme Scenario. Full instructions have been provided on both how to create your own and play Crusader Extreme Custom Scenarios.